Back in April it was revealed Quebec’s La Presse had spent $40 million to launch its free iPad-only newspaper, powered by over 300 staff and Apple’s Newsstand. Speaking at the Tablet and App Summit currently going on in Berlin, president of La Presse, Guy Crevier shared more details about its iPad investment, according to Journalism.co.uk (they translated the French presentation). Crevier called the $40 million number a “meagre” investment compared to what it would have cost to produce a print product, pegged at $174 million according to his estimates. The print edition of the newspaper currently has a circulation of 225,000 during the week, whereas the digital iPad version reaches 1.8 million unique visitors weekly. He explained how research found that few 16 to 34 year olds read daily newspapers – but they use mobiles and tablets. “I am against paywalls,” he explained. “You can’t reach 18 to 34’s with paywalls,” he said. Instead, you reach the “55+ generation”, which he argued is not a long-term strategy for reaching the readers of the future. La Presse charges advertisers $16,000 for a page and companies are paying for the chance to reach their app audience, which stands at 300,000 downloads with 800 new daily readers. Users spend on average 35 minutes daily reading La Presse on the iPad and 70 minutes on weekends. So far, Crevier says their new model is working and expects their investment to be recouped in 18 to 24 months. Seriously, a job well done if they can keep going and become profitable. 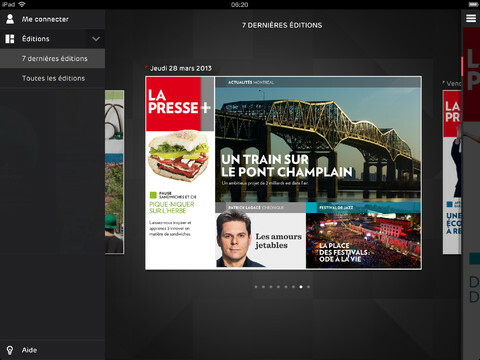 Click here to download La Presse for iPad–it’s free. Are you reading your news via La Presse? How do you like the experience?